St. Paul, MN – Minnesota Republicans are pushing legislation that would make it a crime for people on public assistance to have more $20 in cash in their pockets any given month. This represents a change from their initial proposal, which banned them from having any money at all. House File 171 would make it so that families on MFIP - and disabled single adults on General Assistance and Minnesota Supplemental Aid - could not have their cash grants in cash or put into a checking account. Rather, they could only use a state-issued debit card at special terminals in certain businesses that are set up to accept the card. The bill also calls for unconstitutional residency requirements, not allowing the debit card to be used across state lines and other provisions that the Welfare Rights Committee and others consider unacceptable. It may not be right, Angel. But it sure as hell is effective, and that's why politicians without shame continue to use the poor as their own political punching bags. 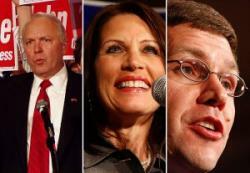 Personally, if I lived in Minnesota, I'd be out looking for skeletons in the Republican closets. It seems to be the most effective way of purging these immoral creeps. GOPers in Minnesota seem to be suffering from memory loss; an unemployed person has to utilize public transit to go out in the world and be proactive in seeking work. Instead, they present the poor with isolation, not letting them use their debit card, sit home and not seek employment. The poor can stay poor because they don’t give a damn. Let’s mix that in with the embattled Planned Parenthood, ACORN, Health Care Reform, undoing child labor laws and the dubious promise to get work for America as a whole. Where are the jobs, John? There is an obvious target on the poverty stricken in this country. Let’s not forget, just as many poor people are Republicans. This won’t fare well and they’re signing their own Get Out of the House certificate. As the classes divide even more with their assistance, this is further proof that their campaign against government spending was simply to gain power and now, they’ve gone power mad.